The office of the King is not hereditary. Malaysia practices a system of government based on Constitutional Monarchy and Parliamentary Democracy at two levels, Federal and State levels. At the Federal level the head of State is the King and the head of government is the Prime Minister. At the state level the head (Ruler) of State is either the Sultan, Raja, Yang di-Pertuan Besar or the Yang di-Pertua Negeri. The Chief Ministers (Menteri Besar/Ketua Menteri) are the heads of state goverment. CONFERENCE OF RULERS In accordance with the Malaysian Constitution, the power to elect and appoint the Yang di-Pertuan Agong is vested with the Conference of Rulers. In the federation system of government (as practiced in Malaysia) where a number of state Rulers are involved, a council known as the Conference of Rulers, was instituted under Article 38 of the Federal Constitution to serve as a forum for the Rulers and Governors (Yang Dipertua Negeri) to meet and deliberate. On certain matters the Federal Constitution provides that the government seek advice from the Conference of Rulers. Article 32(1) of the Federal Constitution provides that there shall be a Supreme Head of the Federation to be called the Yang di-Pertuan Agong. His Majesty shall take precedence over all persons in the Federation and shall not be liable to any proceedings whatsoever in any court except in the Special Court established under Part XV (Articles 182 and 183). The Constitution also provides that the Raja Permaisuri Agong shall take precedence next after the Yang di-Pertuan Agong. As the Head of State, His Majesty has wide powers as provided for in the Constitution. His Majesty has the prescribed roles and functions in the three branches of government, namely, the Executive, the Legislative and the Judiciary. Malaysia does not have an absolute monarchy although it has a king, the Yang di-Pertuan Agong, as the Head of State. What is unique about the monarchical system in Malaysia is that the Yang di- Pertuan Agong is elected by the Conference of Rulers in accordance with the procedure spelt out in the Third Schedule of the Federal Constitution and the rules of the Conference of Rulers. Only one of the Rulers is qualified to be elected. Only the Rulers are eligible to vote. As is the custom, the most senior Ruler is elected. This procedure is no longer adhered to since the Rulers of all States have had their turns to be elected. The first round was completed with the election of His Royal Highness the Sultan of Perak as the ninth Yang di-Pertuan Agong. Since then new list known as the Reconstituted List was drawn up based on the seniority of the States whose Rulers have been elected as the Yang di-Pertuan Agong (the First to the Ninth Yang di-Pertuan Agong). the Conference of Rulers by a secret ballot resolves that the Ruler is unsuitable by reason of infirmity of mind or body or for any other cause to exercise the functions of the Yang di-Pertuan Agong. The resolution shall only be carried if at least five members of the Conference have voted in favour of it. Application of consent for the date of the Election Meeting. If vacancies occur in the offices of the Yang di-Pertuan Agong and the Timbalan Yang di-Pertuan Agong, proceedings for the Election shall not be later than four weeks from the dates when the offices fall vacant. The Keeper of the Rulers’ Seal shall write to every Ruler enquiring whether he desires to be nominated to the office of the Yang di-Pertuan Agong and the Timbalan Yang di-Pertuan Agong respectively. The Rulers who do not wish to be elected shall so notify the Keeper of the Rulers’ Seal, and their States will then be placed last on the Nomination List. When the Conference of Rulers deliberates on the election of the Yang di-Pertuan Agong and Timbalan Yang di-Pertuan Agong, the Governors (Yang di-Pertua Negeri) will not be present even though they are Members of the Conference. The election is carried out by a secret ballot. The ballot papers will be destroyed in the presence of the Rulers as soon as the result of the election result is announced. The ballot papers used are not numbered, but marked with the same pen and ink, and are inserted into the ballot box. The most junior Ruler who is not listed as nominee for the office of the Yang di-Pertuan Agong or the Yang di-Pertuan Agong is appointed to count the ballot papers together with the Keeper of the Rulers’ Seal. Only the Rulers, the Keeper of the Rulers’ Seal and the Assistant Secretary of the Conference of Rulers are involved in the election proceedings. A Ruler may appoint another Ruler as his proxy to vote on his behalf in the event that he is unable to be present at the Election Meeting. During the process of the election, the Keeper of the Rulers’ Seal will distribute the ballot papers to the Rulers, and each Ruler will be requested to indicate (on the ballot paper) whether the most senior Ruler (one name only) is suitable/not suitable to be elected as the Yang di-Pertuan Agong. The nominee must have obtained the majority of five votes before the Ruler presiding over the Election Meeting offers the office of the Yang di-Pertuan Agong to him. If the successful nominee declines the offer or the Ruler fails to secure the required majority votes, the voting process will be repeated with the nomination of the second most senior Ruler in the Seniority List of Rulers. The process will only be completed after the Ruler has accepted the offer of the office of the Yang di-Pertuan Agong. The Conference will then declare the Ruler as the Yang di-Pertuan Agong who will hold office for a term of five years. The office of the Timbalan Yang di-Pertuan Agong, although an important institution, is often overshadowed by that of the Yang di-Pertuan Agong; thus the office and its holder may not be as well-known to the public. The Timbalan Yang di-Pertuan Agong is usually better known as the Ruler of his State than as the Timbalan Yang di-Pertuan Agong. The latter is only noticeable when exercising the functions of the Yang di-Pertuan Agong either during the King’s absence or inability to exercise his functions owing to illness or infirmity. Besides, the Constitution does not accord the office of the Timbalan Yang di-Pertuan Agong a status higher than that of the other Rulers. The Ruler who holds the office of the Timbalan Yang di-Pertuan Agong is not considered as occupying a higher status than that of the other Rulers by reason of his holding that office. The present Timbalan Yang di-Pertuan Agong is the Sultan of Terengganu who only precedes the Sultan of Selangor and the Regent of Perlis, in terms of seniority. The office of Timbalan Yang di-Pertuan Agong is provided for under Article 33 of the Federal Constitution. The Yang di-Pertuan Agong may not be in the country, especially when he is on state visits to foreign countries. Ill-health may hinder the Yang di-Pertuan Agong from exercising his functions. The possibility of the Kings demise while in office, as in the case of the first, second, and eleventh Yang di-Pertuan Agong. The Yang di-Pertuan Agong may not be able to exercise his functions for other reasons. Under such circumstances, the presence of the Deputy Head of State whose functions are clearly stipulated in the Constitution helps solve problems that may arise. When the process of electing the Yang di-Pertuan Agong is completed the election of Timbalan Yang di-Pertuan Agong will be carried out in the same manner. After the completion of both elections, the Keeper of the Rulers’ Seal will write to the Senate, the House of Representatives and the Prime Minister, informing them of the results of the elections. The Prime Minister will issue a press statement announcing the results of the elections of the Yang di-Pertuan Agong and Timbalan Yang di-Pertuan Agong. 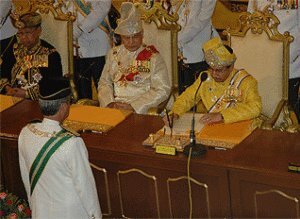 The Yang di-Pertuan Agong and Timbalan Yang di-Pertuan Agong shall only exercise their official duties after they have subscribed to their oath of office in a ceremony before the Conference of Rulers and in the presence of the Chief Justice of the Federal Court and the oath shall be attested to by two Rulers appointed for the purpose by the Conference of Rulers. The Istana Negara is the official residence of His Majesty Seri Paduka Baginda Yang di-Pertuan Agong and Her Majesty Seri Paduka Baginda Raja Permaisuri Agong. It was built in 1928 and was originally the residence of a millionaire, Mr. Chan Wing. During the Japanese Occupation from 1942-1945, it was used as the Japanese Officers’ mess. After the surrender of the Japanese, the building was bought by the Selangor State Government and after being renovated, it became the palace of His Majesty the Sultan of Selangor until 1957. The Federal Government then bought the palace in 1957, to be converted into the Istana Negara. Since then it had undergone several renovations and extensions. But the most extensive upgrading was carried out in 1980, as it was the first time that the Installation Ceremony of His Majesty Seri Paduka Baginda Yang di-Pertuan Agong was held at the Istana Negara. Prior to this the Installation Ceremonies were held at the Tunku Abdul Rahman Hall in Jalan Ampang, Kuala Lumpur. This majestic building is nestled within a serene and beautiful 11.34-hectare compound with a variety of plants and flowers, swimming pool and indoor badminton hall. It is located at Syed Putra Road right in the heart of the capital of Malaysia, Kuala Lumpur. The building has several halls for specific purposes such as the two main halls, the Throne Hall (Balairong Seri) and the Audience Hall (Dewan Mengadap) on the ground floor. The whole area is fenced up and the Royal Insignia of His Majesty is placed on each steel bar between two pillars of the fence. At the front of the Istana Negara, there is the main entrance which resembles a beautiful arch. On each side of the arch, are two guard posts to shelter two members of the cavalry in their smart full dress uniform similar to the ones at Buckingham Palace, London. As the palace grounds are not opened to members of the public or tourists, the Main Palace Entrance is a favourite picture spot for tourists. The Melawati Palace is located in Precint 1, Putrajaya. It has a resort concept and serves as a retreat for the Yang di-Pertuan Agong. Melawati literally means guard’s tower. Designed by YM Raja Datuk Kamarul Bahrin, the palace comprises four components namely, Royal Wing, Arrival Wing, Meetings Wing and the Administration Block. Three guard’s towers form a prominent structure at the side and centre of the palace. Inside the palace at the main staircase of the Meeting Wing, is a Melawati which is made from cengal wood topped with golden roof. The price of the property is not being valued. The people of this country have long known of the Federal Awards. Johor is the first state to institute its own award on 31 July 1886. Then, the other Malay states followed in Johor’s footsteps. During the colonial days, the British government conferred awards on the people of the Federated Malay States in the form of honorary appointments and awards such as the Most Excellent Order of the British Empire. The British High Commissioner awarded the Malayan Certificate of Honour to the people of the Federated Malay States i.e. Perak, Selangor, Negeri Sembilan and Pahang up until l941.